One of the UK’s most iconic sporting venues, and the only one with a back-to-back grandstand, is being redeveloped with the aid of steel construction. Martin Cooper reports. Steel tonnage: 1,800tProbably best-known among sports fans for the Ian Botham-led Ashes Test win in 1981, Headingley first hosted an international cricket match in 1899 and is one of the world’s most well-known sports venues. However, Headingley is not just a cricket venue, what marks it out as a unique sporting arena is the fact that it also contains an adjacent rugby stadium. Home to Leeds Rhinos rugby league side since 1889, this part of Headingley is also steeped in history and hosted the first-ever rugby league Challenge Cup Final in 1897. The proximity of the two grounds means Headingley has a unique north/south stand (north at the rugby ground and south on the cricket side), containing back-to-back seating that overlook both sporting venues. 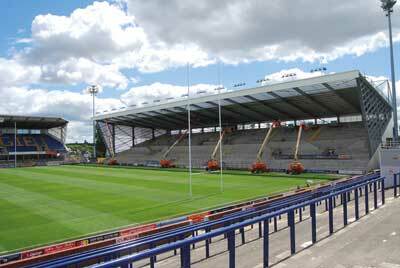 Built in the 1930s, this stand was no longer fit-for-purpose and was recently demolished at part of Headingley Rugby Stadium’s ongoing redevelopment programme. As well as building a new similarly configured stand, the overall works also involve the simultaneous construction of a new rugby south stand. This work on the rugby stadium is also progressing alongside a programme to upgrade the cricket ground. Main contractor for the rugby stadium redevelopment is Yorkshire-based Caddick Construction, the company that previously built the rugby ground’s east stand nine years ago. Work on this phase began with the demolition of the existing south stand and the construction of its replacement structure, which will accommodate a total of 7,721 rugby spectators. 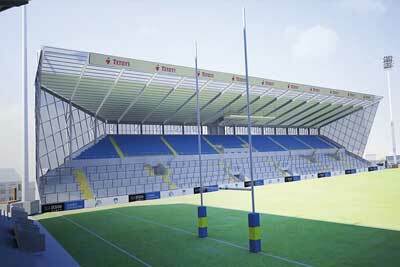 This will consist of 2,233 seated spectators on the upper tier with the remainder standing on the lower paddock. “The main challenge for us is working around the cricket and rugby fixtures which are ongoing throughout our programme,” explains Caddick Construction Senior Contracts Manager Paul Hunter. 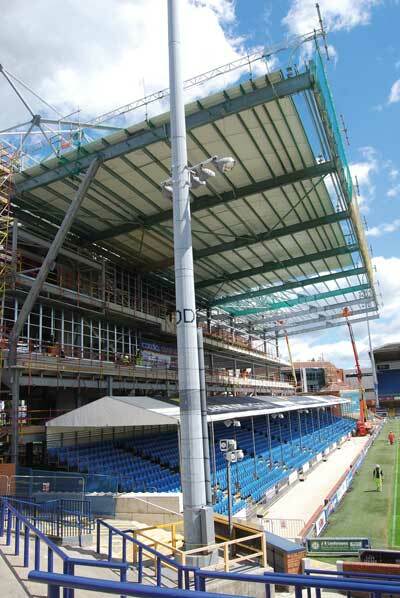 To help accommodate as many spectators as possible during the construction period, Caddick managed to open up a portion of the lower standing tier in the new south stand, while the upper areas were still being completed. “By getting the precast terracing installed on the steel rakers as quickly as possible, we were able to cordon this completed area off during match days to allow fans to use it, even though the rest of the stand was not yet useable,” says Mr Hunter. At ground floor level the new south stand will provide home and away team changing rooms, as well as the referees’ changing room. Off the main concourse male, female and accessible toilet provision and concessions are all publicly accessible. Access to upper levels is provided by a central stair and lift. From the main ground floor concourse standing spectators can access the lower tier terraces. Above this an upper concourse provides access to the upper seating tier via the stair and lift core. The stair and lift core then rises up to a television gantry suspended above the lower terrace level with a viewing position agreed by the television operators. 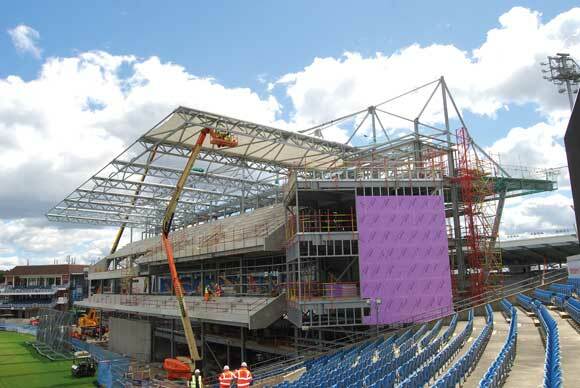 Hambleton Steel has fabricated, supplied and erected approximately 600t of structural steel for the south stand. The largest steel elements are a series of 29m-long fully galvanized rafters that create the cantilevering roof of the stand. The roof rafters are supported by a series of four feature CHS backstays, with one connecting to the roof beam at midpoint and the others attached to the rear of the cantilever and the back of the stand. The south stand will complete this month (September), just in time to host the last few rugby league fixtures of the current season. Meanwhile, on the opposite side of the pitch, the north/south stand is still ongoing and is due to be complete in May next year. The new north/south stand provides seated terraces for both rugby and cricket spectators in a back-to-back configuration with various levels of accommodation and circulation areas. 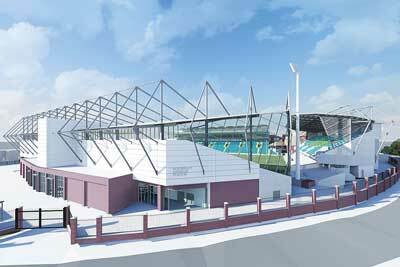 The stand will accommodate a total of 8,048 spectators. 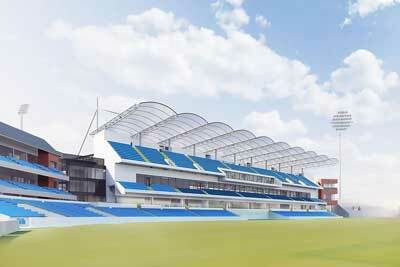 This will comprise 4,223 all seated cricket capacity and 3,825 all seated rugby capacity. The stand will provide high quality new facilities for both grounds and has been designed to complement the two sporting arenas with varying and distinctive roofscapes to the north and south respectively. “The stand’s appearance from the cricket side is a bit more related to the cricket vernacular, with quite a nice barrel-vaulted fabric roof on quite nimble galvanized trusses which span about 26m over four tiers of seating,” explains TRP Engineer Geoff Wilks. On the rugby side, a temporary seating grandstand has been put in to replace the stand during construction. This has presented the project team with some safety challenges concerning safe access and safe egress, having the crowd support systems in place during match days and then actually constructing a stand behind and over it. Once the rugby season is over, the temporary seating will be dismantled, leaving a space for the new stand’s lower tier steel rakers and precast terracing to be installed. Mr Wilks says that ordinarily the terracing units would be installed along with the roof and main steelwork but, in this particular case, there has been a need to think about the stand in a partially complete state. “With construction work more advanced on one side than it is on the other, it’s been necessary to introduce temporary bracing into the frame to give it some temporary stability during construction.